Peter and Paul Cathedral is the most celebrated work by Domenico Trezzini (image, 1896-97). Domenico Trezzini (c. 1670 – 1734) was a Swiss Italian architect who elaborated the Petrine Baroque style of Russian architecture. Domenico was born in Astano, Landvogtei of Lugano (at that time a condominium of the Old Swiss Confederacy), in the Italian-speaking Ticino. He probably studied in Rome. Subsequently, as he was working in Denmark, he was offered by Peter I of Russia, among other architects, to design buildings in the new Russian capital city, St. Petersburg. Since 1703, when the city was founded, he substantially contributed to its most representative buildings. 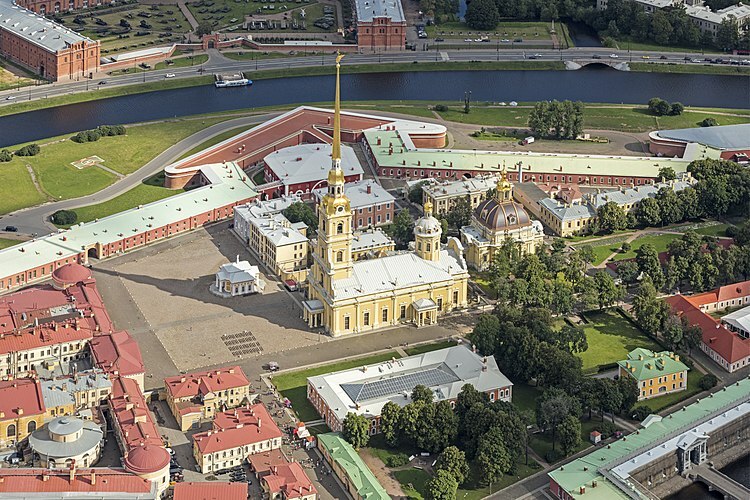 The Peter and Paul Fortress with the Peter and Paul Cathedral, the Twelve Collegia Building (now the main building of Saint Petersburg University) as well as Peter's Summer House count among his many achievements. He also helped found and design Kronstadt and the Alexander Nevsky Monastery. As a testimony of the cordial relationship that linked Domenico Trezzini with the Tsar, his son Pietro (who also became a noted architect, not to be confused with Pietro Antonio Trezzini) had Peter I of Russia himself as a godfather. ^ a b c "Biography of Domenico Trezzini, architect in St. Petersburg". www.saint-petersburg.com. Wikimedia Commons has media related to Domenico Trezzini.